Each day for a toddler is about discovering new things. Just as your baby becomes toddler, her childcare needs also change. Our Toddler Care program, which focuses on toddlers aged 19 months to 30 months, takes into consideration all these factors and provides a safe environment which is suitable for the toddler’s overall development. The magic of childhood lies in everyday moments. 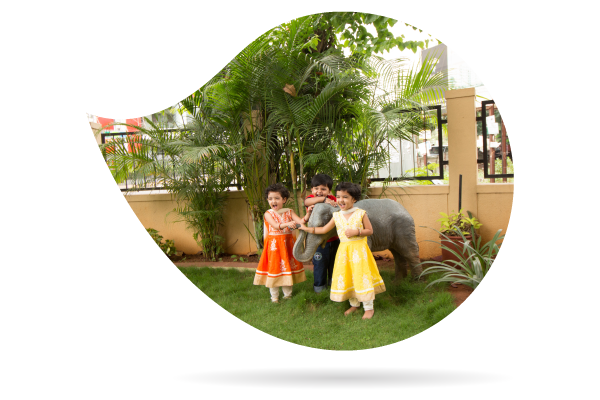 We capture these important milestones and touching moments through photo and video shoots and share with the parents at regular intervals. Freshly cooked, balanced and nutritious snacks and meals served in well designed dining areas. Calm and cozy nap area with comfortable creche beds. Care-giver to child ratio as per global standards. Learning through age appropriate toys and materials. Planned activities to enhance physical, socio-emotional, cognitive, and language skills. Various Life skill activities to make children Self-reliant and responsible individual. A toddler is a bundle of endless energy. Games and activities like Brain Gym Exercises ,obstacle course, ball play, indoor marching, animal jumps, and trampoline fun and many more help to develop a toddler’s gross motor skills which include the development of large muscles. Block play, finger painting, play-dough, tiny chefs pretend play, paper crumpling, scribbling and peeling such activities hone the fine motor skills and hand to eye coordination of our toddlers. Socio-emotional development is the child’s ability to interact with others which also includes helping themselves. At this stage, a toddler is interested in establishing relations with other people, especially children of his age. Our program includes activities like puppet shows, circle time play, following simple instructions and rules,Kinder Musik, nursery rhymes & songs, stories ,Role play and other group activities and celebrations like B’day to build up on the social and emotional strength of your child. Cognitive development is the growth of skills that toddlers use to understand and interact with the world around them. Our program will help to enhance the toddler’s cognitive skills as well as Visual motor integration by stimulating activities like jigsaw puzzle solving, matching and sorting, sequencing, counting, cause and effect techniques. Language development is the child’s ability to both understand and use a language. Exposure to various toddler books, imaginary play, naming pictures of items using flash cards promote development of language skills and build vocabulary. Research shows that the exposure to multiple languages in early childhood proves to be beneficial to the children and a daycare center definitely provides such an exposure.